I am myopic (I don't really know if this is relevant or not) and I usually swim without contact lenses. My vision is clearly better underwater when I am using swimming goggles. I have tried to understand why this happens and I think that it is probably due to the presence of just air (which should be more or less "still") between the googles and my eyes avoiding this way the turbulent flow of water that should somehow affect my vision, due to the fact that air has a different refraction index ($n_1$) than the one of water ($n_2$) and that the material of the goggles is not relevant. But it also could be that the material of the goggles is making the difference. What is the actual physical explanation of this fact? Is blurred effect due to turbulence? No, it is not. The turbulence has a little effect here. Even if there is no turbulence, one see everything blurred underwater. The reason is explained below. An eye is a natural lens. A clear shot of something you see depends on how well the image is focused on your eye. The most of the refraction in the eye occurs at the cornea and a little bit at the lens of the eye. The image is then focused on the retina. But when you are under water, the optical density of the cornea and water are almost the same (or say both have similar refractive indices-1.376 for cornea and 1.333 for water)). If you open your eyes underwater, there will hardly be any refraction because now the light is going from a medium (water) to another medium (cornea) with the same density, so refraction never takes place. If light entering the cornea is not properly refracted, it will not be focused on the retina to give you a clear image. This is why you see everything blurred underwater. The use of swimming goggles can overcome this defect. Your eyes work perfectly if light enters your eye from air. That principle is made use of in swimming goggles. When you use goggles, you have some air in-between the cornea and the glass of the goggle. So even if the light is coming from underwater it first passes through the air and then only it reaches the eye. So you feel exactly like on ground and see things well. This is for a normal person. You are myopic. The air-glass interface in front of your eye helps you like you have your contact lenses while on ground by providing better refraction. It may work for every myopic persons. Try use goggles while on ground. This may not help. It's because the light is now entering your eye from air. So there will be a slight difference in focusing. Same effect is when you use your contact lenses underwater. Yes, your myopia is relevant in the sense that you notice immediately a huge improvement in your long distance vision when wearing goggles underwater. Short-sighted people have difficulty in focusing distant objects (or nearly parallel light rays); the eye is "too long" for the lens and the focus falls in front of the retina. Corrective lenses for myopia are concave, compensating for the excessive curvature of the eye's lens. Exactly the same effect is provided by the interface between the water and air behind your googles. This additional refraction, away from the normal, allows your eye to focus images onto the retina that it would be unable to if viewed at the same distance in air and may even allow you to focus parallel rays (i.e. focus objects at infinity). Here is a handy diagram from an answer by Floris. The clear area is the air behind your goggles. You can see that the blue light rays will be brought to a focus further back than the green rays which would be how the object would appear without the mask. 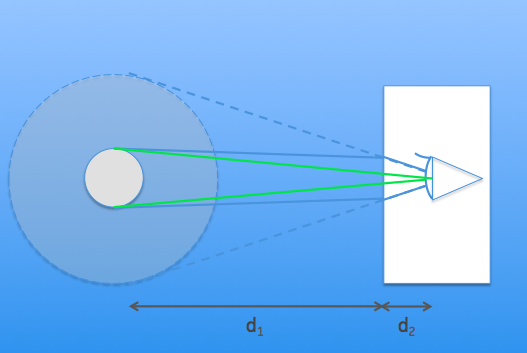 This also explains why objects appear larger underwater. Not the answer you're looking for? Browse other questions tagged optics everyday-life refraction vision or ask your own question. Why would an object appear a different size when in water? Getting nonphysical results when solving for the index of refraction of a slab? Lens surrounded by two different materials? Why is it easier to get sunburnt in the water?